This year there will be a kids/family friendly tournament, FREE to enter. Registration will start at 11:00AM and go until 1:30pm, with tournament running 2pm-5pm. 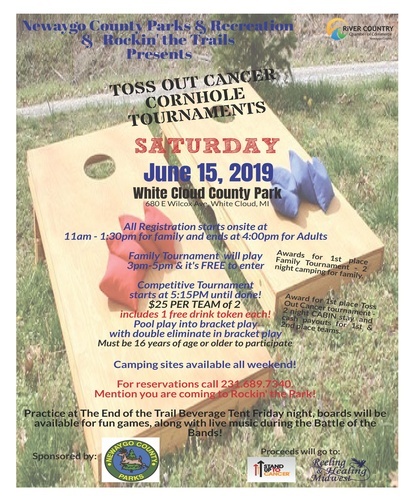 Must be 16 years or older to enter - Toss Out Cancer tournament. Camping sites available all weekend - come in Friday night to practice, enjoy the End of The Trail Beverage Tent and the Rockin Good Time Battle of the Bands. Saturday events are Trail races, kayak races, duck race, Amazing Race for kids, End of the Trails beverage tent, vintage camper tours, live music, guided North Country Trail Hikes - plenty to do, bring the family for lots of fun at Rockin' the Trails - a Trail Town Celebration.